As college students around the country start heading back to the dorms and purchasing their books for the semester, textbook rental giant Chegg is making major waves in the space with a number of new announcements. First off, Chegg is finally going digital, and is going to be steadily rolling e-textbooks on its platform with goal of offering millions of both print books and e-textbooks to students by the end of the year. Second, Chegg has partnered with a number of publishers (including four of the top five educational publishers) to offer e-textbooks to its students, such as Cengage Learning, Elsevier, F.A. Davis, Macmillan, McFarland, McGraw-Hill, Oxford University Press, Rowman & Littlefield, Taylor and Francis, and Wiley. 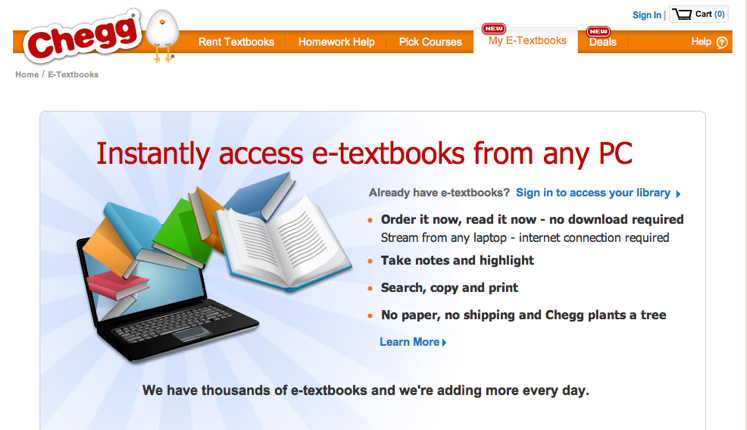 For background, Chegg was founded in 2007 and has become the largest textbook rental giant for college students. In fact, millions of students across 7,000 campuses are using Chegg for rentals. But in a space with a number of other competitors, such as BookRenter, CampusBookRentals, and eCampus, and others; the company has expanded its strategy beyond just rentals to compete in the space. Over the course of the past year, Chegg has acquired CourseRank and Cramster, which help students pick courses and study for them. The company also picked up study guide services Notehall recently. The company also just announced that it has acquired Student of Fortune, an online tutorial marketplace for those who need help or can help others with homework. Student of Fortune, which was founded in 2005, allows students to pose questions or post tutorials on a wide variety of subjects. Students can post a question that is then sent to a network of Student of Fortune experts, who in turn writes a tutorial that helps answer the question for a fee. Students can also serve as experts, earning money themselves for writing tutorials. The service is already used by more than 300,000 students. Of course, we all know digital textbooks are the future and companies both big and small are throwing their hats into the ring. Amazon is now offering digital textbooks on the Kindle. And Kno (which was actually founded by Chegg’s co-founder Osman Rashid) is also playing in the space, as is Inkling. But one thing that Chegg does have in its favor is the millions of students that already know the brand as the textbook-rental giant. With the digital books offering, students can download HTML5 formatted, browser-based e-textbooks that can be ready on any device, including an iPad. Each book will come with one-click subject navigation and include the ability to highlight, take notes and search directly in the book. Additionally, the e-textbook offering will include a “read while you wait” tool, where students can access their textbooks online while they wait for their hardcopy textbook to arrive. That’s a really useful feature for anyone who waits until the last minute to order textbooks (I know I did back in college and grad school). You can also choose to rent or buy e-textbooks. Rosensweig says that the release of digital versions of textbooks will be a gradual process, and already has tens of thousands of digital books on the site. At the end of the year, the goal is to have a digital book offering for one our of every two searches on the site. And he adds that it is a priority for Chegg to offer digital versions of the popular books that people want (i.e. required textbooks). Clearly Rosensweig has an ambitious plan for Chegg, and it’s evident when speaking to him that he’s very optimistic that the company will become the go-to educational resource and platform for college students and beyond. Revenue, according to our calculations in January were around $150 million, and that number has probably grown since then. Rosensweig confirms that revenue is “growing nicely,” especially now that the company has added new revenue streams with daily deals, and through premium services offered by the company’s acquired technologies. In fact, he says that all revenue channels have increased. Beyond just revenue, there are those rumors of a planned IPO for Chegg. Rosensweig said this of a public offering: If it makes sense, we will consider it. Right now, we are seeing very good growth, and have a good amount of financing. Chegg has raised $219 million to date, most recently adding $75 million to its coffers last Fall. I have a feeling we’ll see more aggressive movies coming from Chegg in the near future.